This was a White Bread challenge for me. I've always wanted to learn how to make a good bread. Getting a nice, crusty loaf straight from the oven is not an easy task. I wanted to make an "everyday" bread that was easy to make since alot of us don't have the time to be baking bread! The first recipe I tried was called "Easy Everyday Bread". Throw all the ingredients in a bowl, let it rise in the fridge overnight and bake it the next day. Sounds simple enough. The measurements were totally off and I got something similar to a batter. Recipe #2 was more of a traditional method. The dough was more workable and had a nice rise. It did not rise anymore than what you see here. My yeast was not expired and these recipes called for all-purpose flour. The birds are having a field day! A recipe directly from Red Star Yeast. Bought some fresh yeast and BREAD FLOUR! Why should you go through all this trouble? When the weather gets cool, I like to bake and when I saw the ingredients in a loaf of store-bought bread - Home Pride Honey Wheat (which is what I usually buy) it was kind of disturbing. This recipe is for just one loaf of bread. I was not going to make more until I was sure about this recipe. Twice bitten! This can easily be doubled for two loaves. You can visit Red Star for directions using a Bread Machine, a hand-held mixer or Food Processor method. Dissolve yeast in warm water and let stand 5 minutes. Combine dry ingredients and liquid ingredients in mixing bowl with paddle attachment for 4 minutes on medium speed. Gradually add flour and knead with dough hook 5 to7 minutes until smooth and elastic. Place dough in lightly oiled bowl and turn to grease top. Cover; let rise until doubled (about 1 hour). Turn dough onto lightly floured surface; punch down to remove air bubbles. Roll or pat into a 14 x 7-inch rectangle. Starting with the shorter side, roll up tightly, pressing down into roll. Pinch edges and ends to seal. Place in a greased 9 x 5 loaf pan. Cover; let rise 1 more hour. Not perfect, but its over the top of the pan! Bake in preheated 375 degree F. oven 30 to 40 minutes. 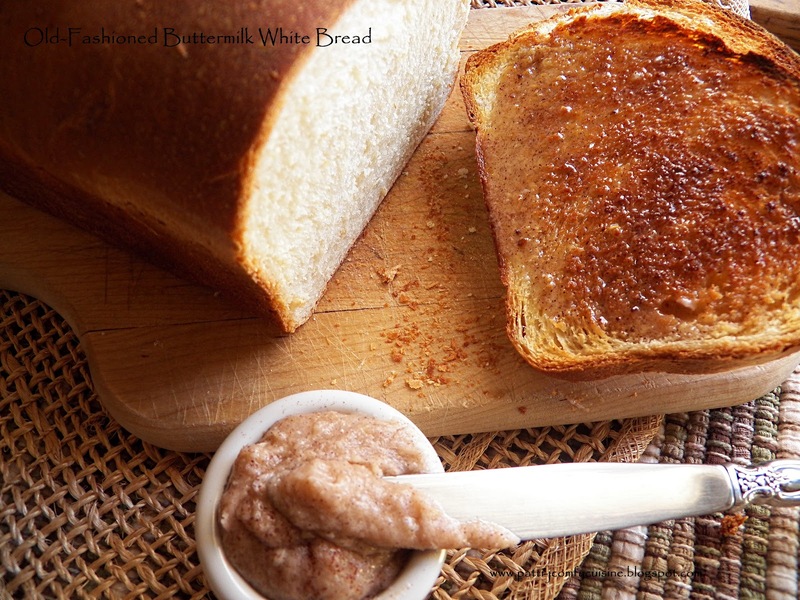 Use the Cinnamon Honey Butter on toast, pancakes, waffles, sweet potatoes, etc. Try and bake a loaf on the weekend when you are not so busy. The yeast is doing all the work - not you! I don't eat a whole lot of bread, but I do love it. Totally agree with you on being afraid when you read the label of store-bought bread. I think my new "rule" is going to be that I only eat slices of bread if the loaf is homemade. Wow. That last loaf looks amazing! Looks exceptional..I love baking and I am still tryimng to get the perfect loaf.The last time My bread resembled a pound cake ,though it still tasted like bread. this bread looks perfect!!! yum! I have made this several times and it has been a hit every time I have served it or brought it somewhere.